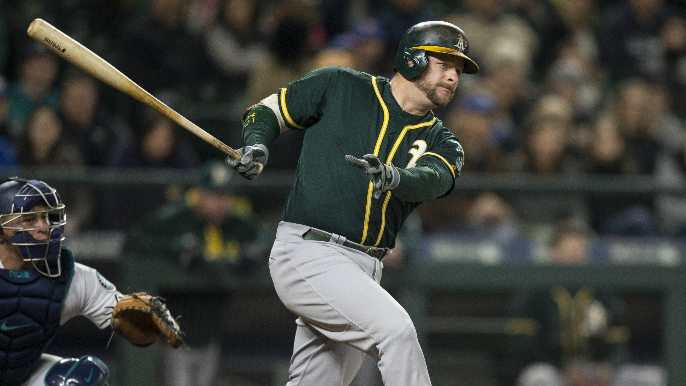 On Monday, Alex Pavlovic of NBC Sports Bay Area reported that the San Francisco Giants are expected to sign veteran catcher Stephen Vogt to a minor-league deal. This deal is contingent on Vogt passing a physical, which isn’t necessarily automatic given that Vogt had season-ending surgery last May on his shoulder, and while he has said he feels better than ever, he has still not thrown out of the crouch yet. This signing is the next in a long line of minor league deals Giants VP of Baseball Operations Farhan Zaidi has executed this offseason, and with the recent departure of Nick Hundley, Zaidi feels Vogt — a player whom he worked with in Oakland from 2011 to 2014 — can add more depth to the catcher position. The 34-year old two-time All-Star split time in 2017 between Oakland and Milwaukee, batting .233 with 12 home runs while providing a veteran presence to an otherwise young locker room in Milwaukee. Vogt made back-to-back All-Star games with the A’s in 2014 and 2015, posting a slash line of .268/.333/.438 with 27 home runs and 108 RBIs during those seasons combined. If the Giants do indeed add Vogt, he will be the second veteran catcher the club has signed to a minor-league deal in the past week after adding former Angels catcher Rene Rivera on Friday.